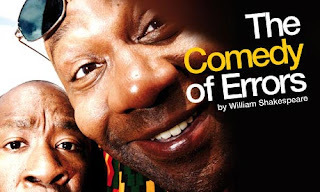 Last Friday night Stu and I went to see Dominic Cooke's take on the Bard's The Comedy of Errors at the Olivier Theatre on London glitzy South Bank. 'Starring' Lenny Henry we weren't quite sure what to expect, but trusting the National to put on a good show we weren't too worried. And what worries we had had proved unfounded. It was a great show. The setting was modern day (ish) which worked surprisingly well. The action took place in a slightly jarred reality - at times were we in Florida? A European port? Maybe a posh London street? Anyway, the set design was great for all that - towering, twisting, sliding and thrusting - it transported us from a storm on-board ship to a town square effortlessly. The basic plot idea of two pairs of long lost twins starts with the maelstrom at sea but goes on to create one of increasing confusion amongst their nearest and dearest. The chaos as perfectly executed. Within the same scene the director took the action effortlessly from an intimate tête-a-tête of wordplay between two players to a full blown knockabout farce involving the wider cast. And what a great cast they were. Played with such gusto it was hard to fault a single player. Genius idea was having the the wife Adriana and her sister Luciana played as WAGS. This choice fitted the bill perfectly - their lines came alive when seen from that perspective. Another nice touch was the four-piece band playing latino versions of recent hits during scenery changes. 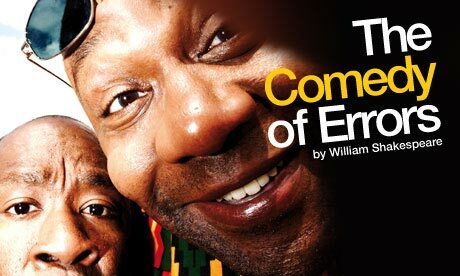 And now let's come to Lenny Henry. What to say about him? Can he act? Was he any good? Well, that's an easy one to answer. He was great. Brilliant in fact. Just the right amount of verbal dexterity. just the right amount of physicality, just the right amount of mugging at the audience. Pitch perfect in fact. The boy can act! So my conclusion? The production is a riot. Funny, well-acted and a must-see.